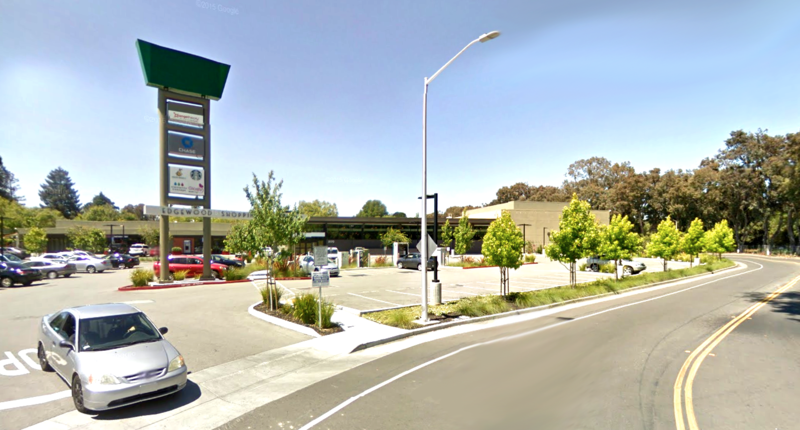 This is an example of a “node” antenna located at Newell Road and Hopkins Avenue in Palo Alto. At left is the equipment box. At right is the top of the antenna. Photos were provided to the city by Verizon. 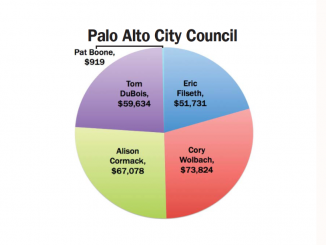 Eleven planned “small cell nodes” intended to improve Verizon coverage in Palo Alto will spring up after all, angering dozens of residents who stormed City Council last night (May 21), up in arms about the antennas that would be mounted on utility poles. Council voted 6-3 — with council members Lydia Kou, Greg Tanaka and Karen Holman dissenting — to reject seven separate appeals of the boxes planned for Louis Road, Elbridge Way, Loma Verde Avenue, Kenneth Drive, Stone Lane, Colorado Avenue and El Verano Avenue. Two amendments proposed by Councilman Tom DuBois were intended to soften the blow for residents who opposed the antennas. One amendment would have city planners look into the idea of preventing future equipment from being added to the same pole to prevent the antenna from becoming too large. Another amendment instructed planners to monitor other communities to see if they’re successful in placing equipment for the antenna underground. Verizon intends to put the equipment on the pole below the antenna, which drew objections from residents. Verizon insisted that it’s not feasible to put the equipment underground, a claim residents and council members doubted. DuBois pointed out that in one case, Verizon only had to remove some bushes and a fence to underground a particular node. The hearing took about four hours and included comments from approximately 40 residents, most of whom expressed outrage about the nodes. Most focused on aesthetic concerns about the boxes as well as the noise and radiation they emit. Some residents said they were worried the poles might topple over in a natural disaster like a fire or earthquake. “I don’t think phone poles are very attractive to begin with,” Kniss said. A few commenters said they had poor cell service in town and welcomed the improvements they expected from the equipment. At one point, Kniss called for a 10-minute break because of repeated yelling from angered residents, some of whom had called out “Not fair,” when she asked the room how many of them owned cellphones. Councilwoman Karen Holman condemned the residents’ boisterousness and contrasted their behavior with that of the residents of the Buena Vista Mobile Home Park, who she said had shown remarkable civility over years of fighting for their endangered homes at public meetings. 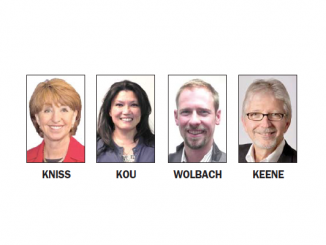 How many more of these are coming now that these 11 have been approved? Watched the meeting last night and I was astounded by the ignorance displayed by many residents on the issue of supposed radiation hazards. Handheld cell phones, because of intimate proximity to the user’s head, provide RF exposure levels to their users that are orders of magnitude higher than transmissions from cell towers. If one accepts that there is at least some question about health risks from handset use, then it follows that this risk is reduced by lowering the handset’s transmit power. But handset transmit power is governed primarily by RF path loss between the handset and the serving base station; the lower the path loss, the lower the handset transmit power. Thus, by having a serving cell tower close by, a cell phone user actually may reduce any risks associated with RF exposure. The equipment is really ugly and the fans make a hissing sound. 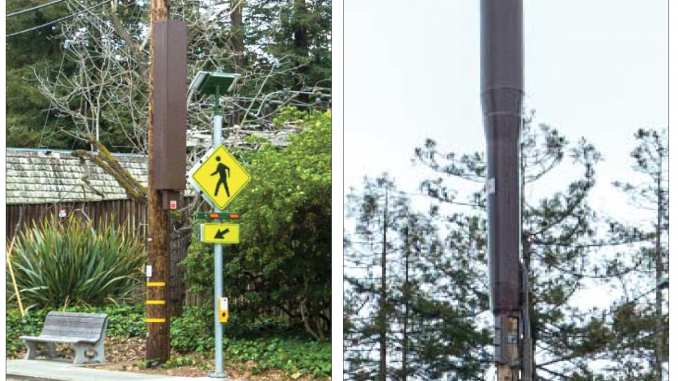 Having the antennas is probably a necessary evil – having Verizon conceal the equipment is a demand that Palo Alto city should have pushed for. The city did a “bend over” for Verizon – losing faith in the people we elect. Shows how weak our elected officials are. Oh sorry did I say – “bend over”. Now t-mobile & Sprint will be rushing soon to hang their ugly equipment on rest of the poles – “Think underground” that’s good for the property values and over all beauty of Palo Alto. Glad City Council approved this. Verizon’s service in Palo Alto is spotty and these antennas don’t seem all that intrusive. I’ll trade the nodes for roundabouts. The roundabouts are annoying and too narrow. I’d like it if the city removed a roundabout for every node they install. Those in favor of the cell antennas or those who do not find the units intrusive/ugly, please post your property addresses and contact information. We will keep that in mind when new antennas need to be installed.